Felicity streets, in New Orleans on January 30, 1970.
and that all his recorded tapes were confiscated by management. except for some ABB shows. 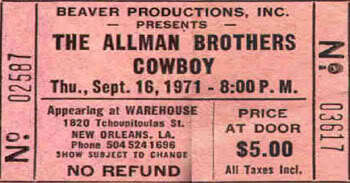 JD: Is Bob going to record this Allman Brothers’ concert? Marc: No, Bob is gone. JD: Where did he go? Marc: I don’t know. They took his tapes and let him go. and set it up under the bench on the side of the stage. Cowboy didn’t play that night. Wet Willie played instead. and recorded a 1 minute test. Everything seems OK.
near my setup. All clear. OVERLOAD ! - VU METERS PEGGED IN THE RED ! Blue sky ? Is that a country song? No wait, that’s cool ! 2 ENCORES: Revival and Mountain Jam. hours of sleep before having to wake up early for classes at high school . 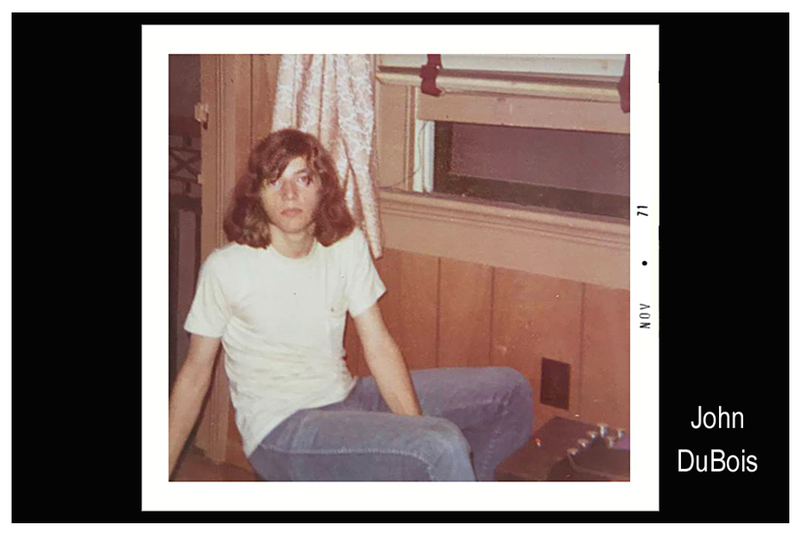 I was 16 years old, and I felt like I had been tied to the whipping post. on 10/29/71 and I was shocked. And then Berry, about 1 year later. any plan as to what should be done with the tape or who to share it with. This guy just spent $30 for an ad that was a long shot at best. Should I call this guy ? What a strange coincidence this was. really blow his mind by calling him up. JD: Hello, I’m calling about your ad in The Times-Picayune paper. 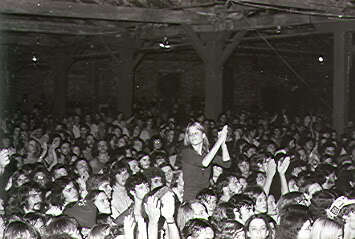 around 1970-71 from the Warehouse ? Chaffe: Yes, this is Chaffe. JD: What do you want them for ? Chaffe: I’m a tape trader, we freely trade tapes of the band. 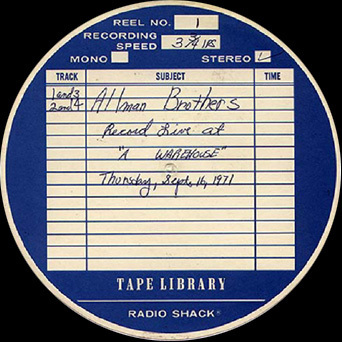 Well I think that I have an Allman Brothers tape in the garage. Chaffe: Really !? What’s the date ? JD: Call me back later and I’ll look for it. Chaffe: How did you get it? JD: I recorded it at the warehouse. Chaffe: How did you do that ? Chaffe: Really ? Please give me your number. OK thanks. JD: Hello ? yea I got the reel to reel tape in my hand. 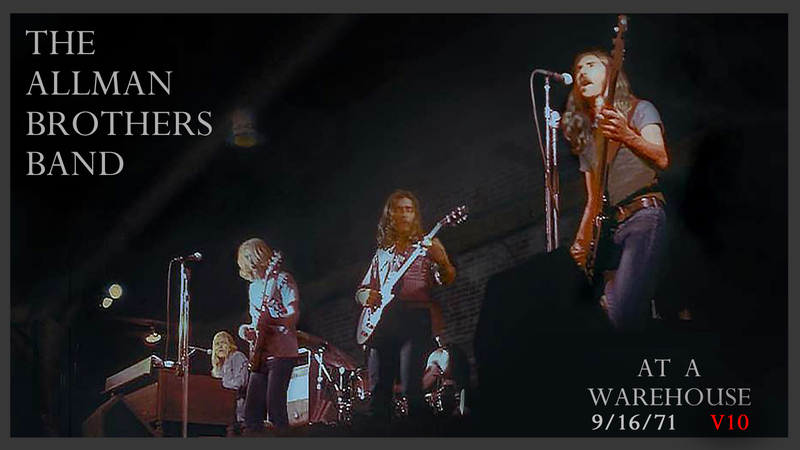 The date is Thursday, Sept.16,1971. Chaffe: ….I have never heard of that show. Does it have Blue Sky on it ? J.D. Yes, I believe it does. Chaffe: Can I get a copy from you ??? JD: What is this tape worth ? ¼ track stereo at 3-¾ ips. 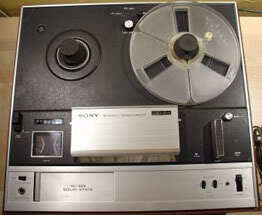 I have another deck, a Sony TC-880-2 that only plays 7 & 15 ips. I’ll see if I can modify the speed circuit to slow it down to 3-¾ ips. The tape is in poor condition. The oxide is starting to come off. Call me later and I’ll let you know what I find. and wow and flutter spec. is fantastic. I’m ready to do a copy now. But, I have to adjust the EQ on an outboard mixer. Chaffe: Can you make me a DAT copy? JD: ….I don’t have a DAT machine. Chaffe: I’ll send you mine. ABB 9/16/71 DAT tape to send back to you. 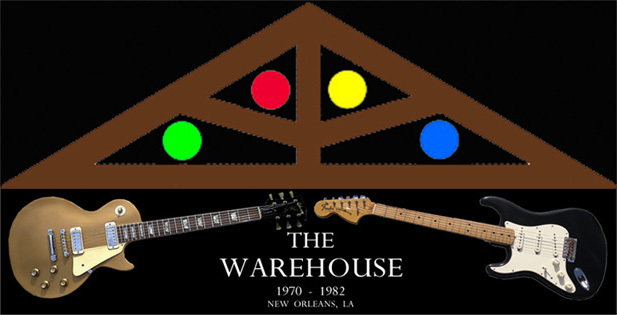 ( Where did this “The Lost Warehouse” Tapes BS come from ? Let me say that I have never lost this tape. I always knew that I had it, and I knew where it was. JD: Hello ? 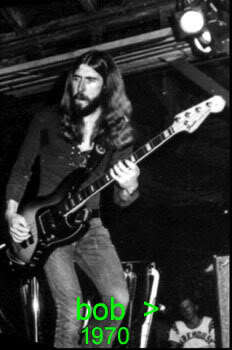 Yea, I’m sending you another ABB 9/16/71 DAT V2. cymbals and high frequency information back. It sounds brighter. 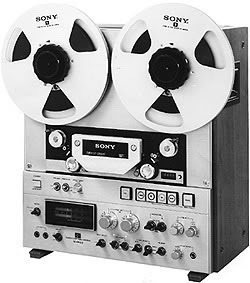 2 - AKG D190 mics in the rafters > Lo/Hi Z > Sony TC-355 Reel (1971). HD > Nero wave editor > Nero burning ROM > CD. waitressing job at 'Jim's Fried Chicken' on S. Carrollton Ave.